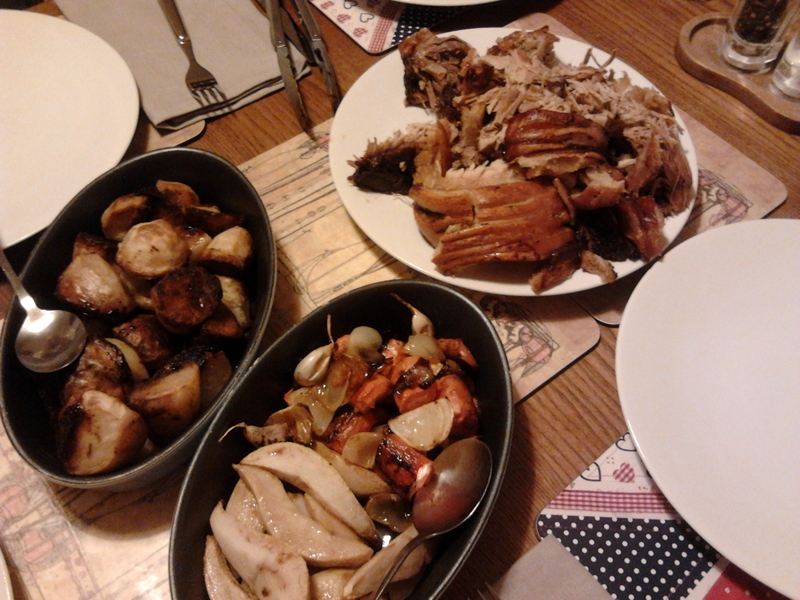 Next up this weekend was the slow-roast pork. I’ve actually cooked this a couple of times before, but I had to do it again to make sure I did all the 100 recipes this year. First up is the fennel rub. 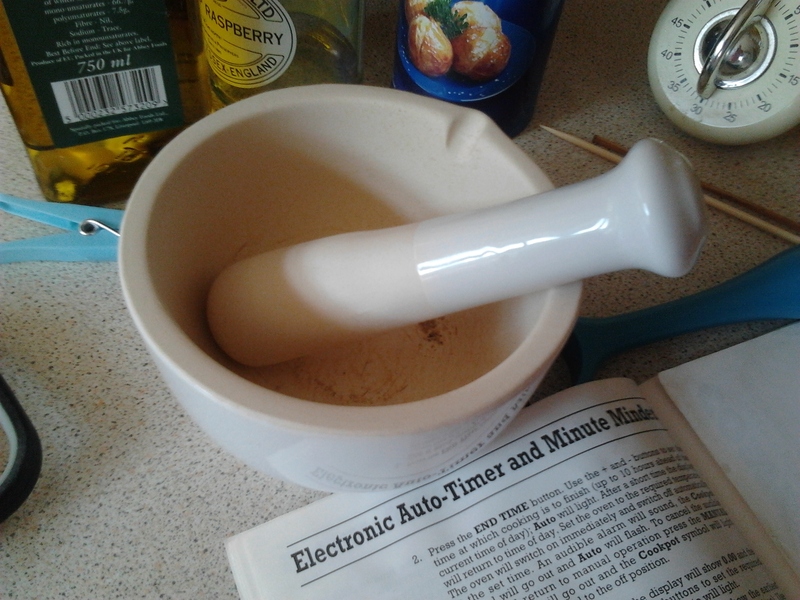 Gone are the days of grinding spices in a cup with my mini tart shaper (see Essential Kit); I have been given a pestle and mortar! 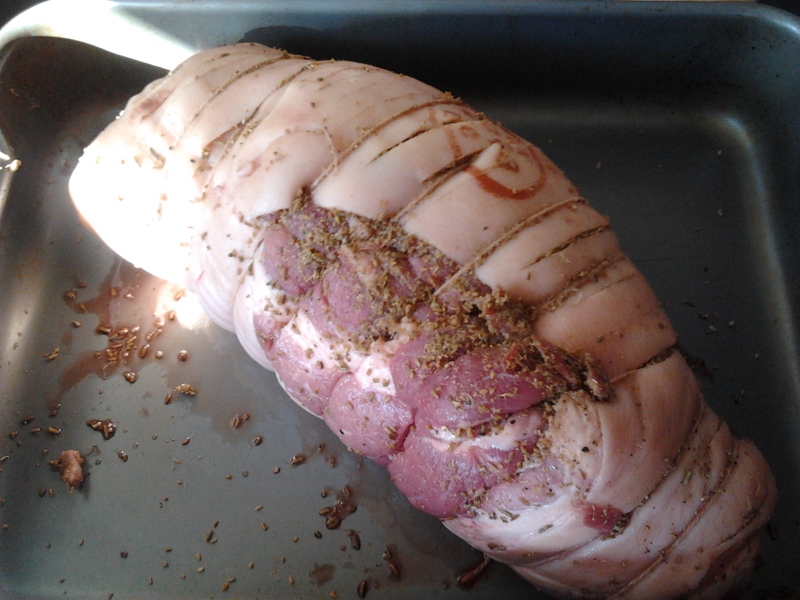 Then I rubbed the rub onto the pork joint which this time already had a slashed rind (thank you Tesco). It went in a flameproof roasting tin – you want to stick it on the hob later for gravy. And it went in the oven for 6 hours. The last couple of times I made this, the oven was a bit hot, so this time I went for 140’C which was perfect in my oven for this 2.8kg joint. I then went shopping. 4 hours and one very successful shopping trip later, I added chunks of potato under the joint (this protects them a bit from burning and means they get all meaty). After another hour I added chunks of carrot, onion and garlic. Half and hour after that I added 2 peeled and quartered pears. Half an hour later the whole thing came out of the oven. I kept the veg warm while the pork rested and I got on with the gravy. After watching Lorraine make gravy, I now understand the concept properly! Adding flour to water makes a lumpy, doughy mess (you can add cornflour to water though, as it only contains starch, which doesn’t do the whole lumpy thing). So for perfect gravy, you first need to mix the flour and oil. 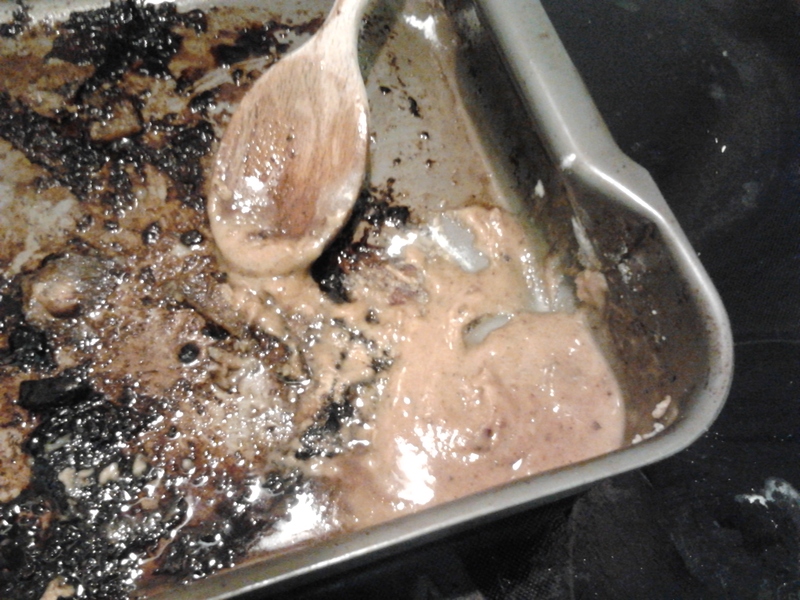 I mixed about 1 tbsp of flour with 1 tbsp of fat from the roasting tin, in the corner of the tin. You make a sort of “roux,” which coats every flour granule in oil. It can now spread out in the water (stock, wine etc.) 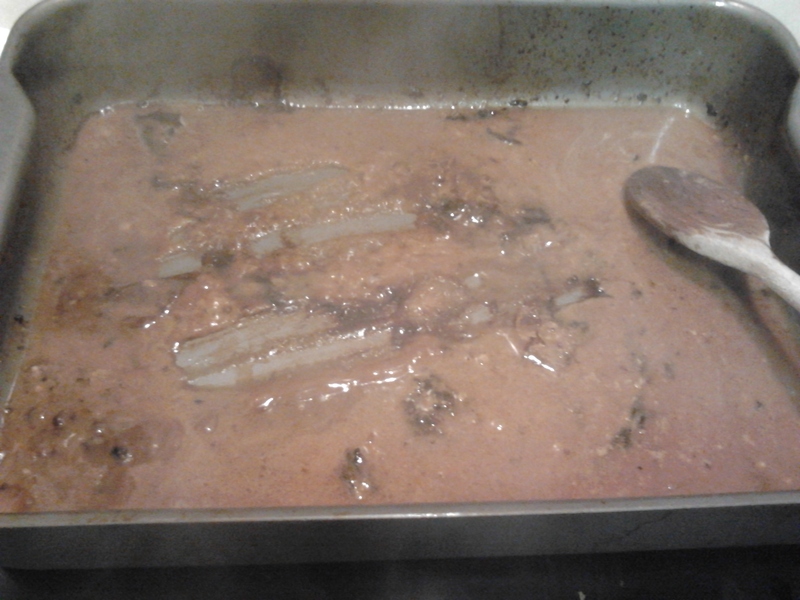 without blobs, and do its job of thickening the gravy. Then you add a glass of white wine which de-glazes the tin (this means it gets all the meaty goodness off the bottom of the tin into the gravy, and essentially does your washing up for you). Stick it on the hob with the heat under it and let it boil so the harshness of the alcohol disappears. 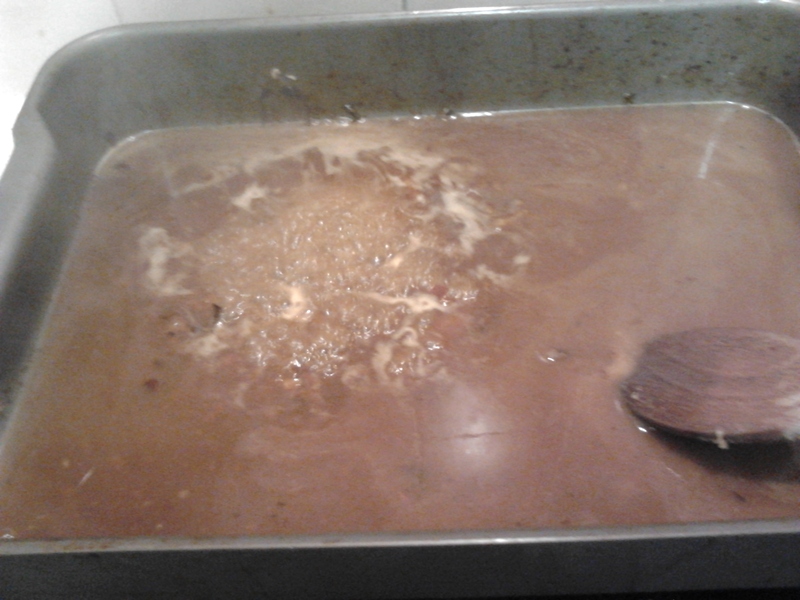 Add your stock and let it bubble away and thicken. 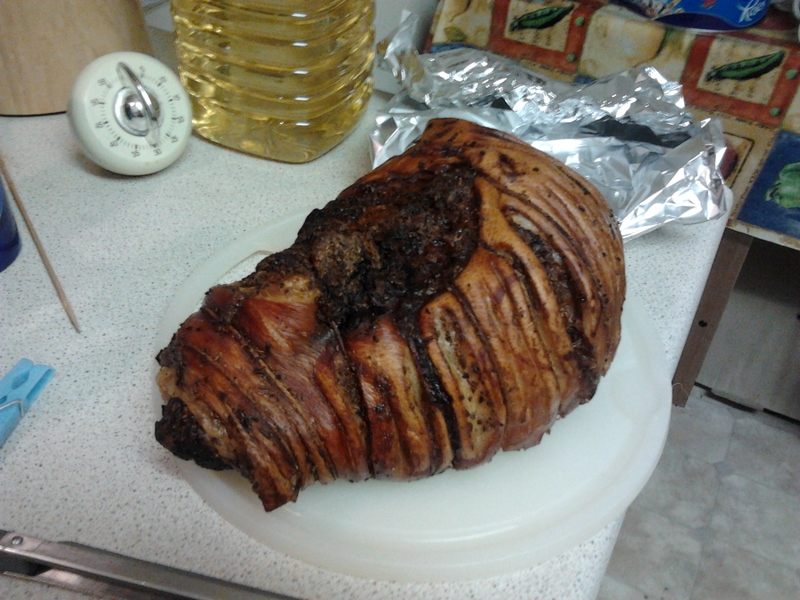 This time, the pork crackling was absolutely perfect, so I’ll stick with the same oven temperature next time. Serve the pork with the gravy, and the roasted vegetables. The pork is so tender, you can’t really carve it, but it falls apart beautifully! This is gorgeous and a really easy way to roast, but my one complaint is that all the food is the same colour, having been cooked in the same tin! Perhaps it needs some peas to jazz it up? Thanks for this. I’ve been looking for this recipe again as I’d lost it. First (and only) time I tried it I followed the recipe exactly but as I’d never cooked pork before I hadn’t realised my butcher hadn’t given me any of the skin for crackling!!! No wonder it didn’t quite work. I shall try again now that I am better informed.